Hayley Atwell as Margaret Schlegel and Matthew Macfadyen as Henry Wilcox in Howards End. I managed to watch the miniseries a few months, and though I admit it’s not as sharp or luxurious as the 1992 film starring Emma Thompson, Helena Bonham Carter, Anthony Hopkins, and Samuel West, it is breathes more life into the narrative. There is more historical context, and a deeper complexity into the issues of class and race that Forster hinted at in his novel. Also, I love Hayley Atwell and appreciate any time she’s on my screen! If you don’t have Starz, I highly recommend the 30-day trial offered by Starz through their app or through an add-on service to Amazon Prime Video or Hulu! The long-gestating NBC drama “The Gilded Age” is moving forward with a series order, the network announced Wednesday. 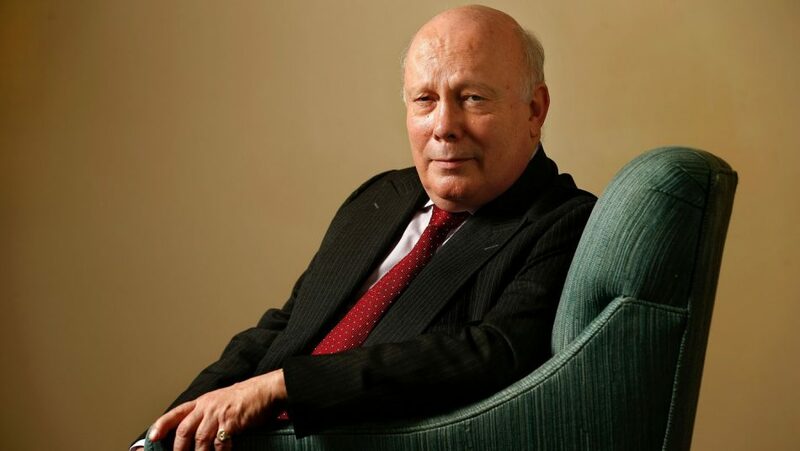 “Downton Abbey” creator Julian Fellowes will write and executive produce the series, with “Downton Abbey” executive producer Gareth Neame also executive producing. The series has received a 10-episode order and is scheduled to debut in 2019. The series will be produced by Universal Television. The series was first put in development at NBC back in 2012. The Gilded Age in 1880s New York City was a period of immense social upheaval, of huge fortunes made and lost, and of palaces that spanned the length of Fifth Avenue. In the series, Marian Brook is the wide-eyed young scion of a conservative family who will embark on infiltrating the wealthy neighboring family dominated by ruthless railroad tycoon George Russell, his rakish and available son Larry, and his ambitious wife Bertha, whose “new money” is a barrier to acceptance by the Astor and Vanderbilt set. No word yet on the cast, but I have high hopes for a story as addictive and dramatic as Downton Abbey! Want to know more about Gilded Age New York society? Read these books! Gilded Age New York was a veritable playground for men both bachelor and married alike. From the Lobster Palace restaurants to the Bohemian enclaves of Greenwich Village to the theaters dotting Broadway, there were a variety of entertainments–and women–available for gentlemen to partake. 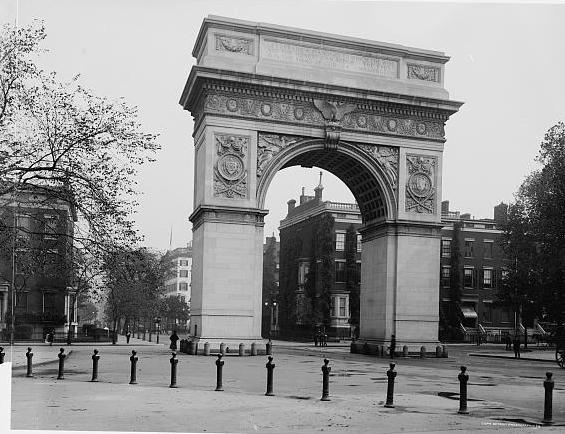 The quintessential man-about-town of the period was the famed, wealthy, and handsome (by the standards of the day) architect Stanford White. White and his partners McKim and Mead were–along with Richard Morris Hunt–the men who defined the architecture of the Gilded Age. White designed many of New York’s most celebrated buildings and edifices, from the Arch at Washington Square and Madison Square Garden II to the “cottages” on Newport (Rosecliffe) to the mansions on Long Island’s Gold Coast and down the Atlantic seaboard. 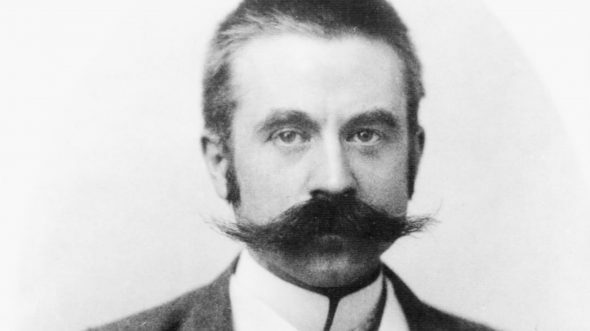 Stanford White had collected a bevy of like-minded friends by the 1890s, from society photographers, to artists, to Wall Street bankers, and the like. 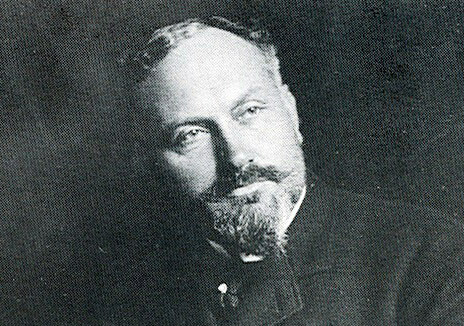 James L. Breese, the aforementioned society photographer, had a reputation just as naughty as White, stemming from his notorious all-male midnight salons. These late-night suppers were equally sumptuous and scandalous, where the main course were the pretty young women hired as waitresses. It was only natural that someone devised the idea to make a pretty young woman the actual main course. 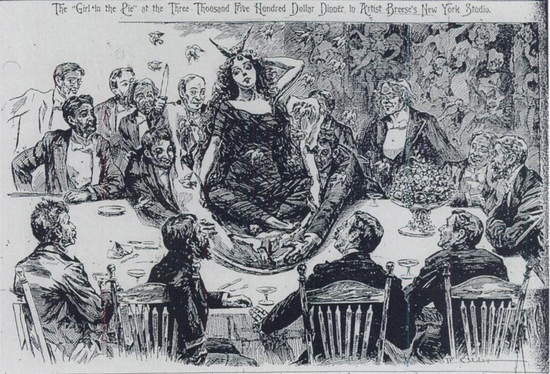 The 1890s were already becoming notorious for lavish stunts pulled by bored, wealthy “400” socialites, but there was still something a bit shocking about this dinner. Somehow, months later, Joseph Pulitzer’s tabloid newspaper The New York World managed to get a scoop on this dinner, and suddenly, Stanford White’s lurid, seedy doings were splashed on the front pages of the metropolis’s most notorious newspaper. The paper described the dinner in excruciating detail, from the scantily clad young waitresses to the names of the dinner guests to the naked girl–Susie Johnson–who sprang out of a large pie. Johnson later disappeared (newspapers reported her death a little over a decade later: the wages of sin), and Stanford White’s personal reputation acquired a slight stench. Though he was not fully ostracized, when he was murdered by Harry Thaw in 1906 out of jealousy and madness over deflowering his young wife, Evelyn Nesbit, many were not surprised or sympathetic. Some news reports went so far as to call White a pervert. New York as a bachelor’s playground did not disappear, of course, but the specter of Stanford White was a warning to all men who dared to skirt the edges of respectability.